Chem. Asian J. 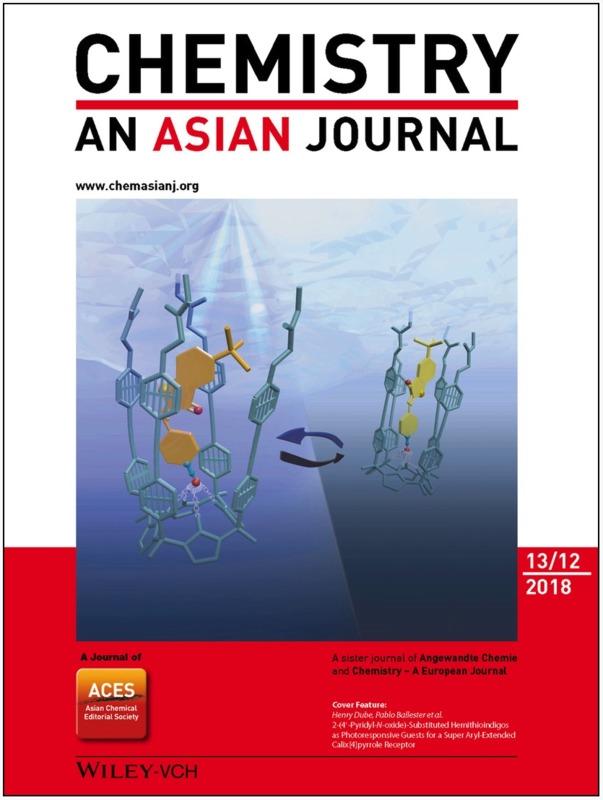 2018, 13 (12), 1632-1639, DOI: 10.1002/asia.201800463. We report the synthesis of two 2‐(4′‐pyridyl‐N‐oxide)‐substituted hemithioindigos (HTIs). We probed their photoisomerization by using UV/Vis and 1H NMR spectroscopy techniques. Light irradiation at λ=450 nm provoked the isomerization of the HTI Z isomer to the E counterpart to a large extent (≈80 % at the photostationary state). 1H NMR titration experiments revealed the formation of thermodynamically and kinetically stable 1:1 inclusion complexes of the (Z)‐HTI isomers with a super aryl‐extended host (association constant>104 m−1). Photoirradiation at λ=450 nm of the inclusion complexes induced the isomerization of the bound HTI N‐oxide to afford the (E)‐HTI⊂calixpyrrole complex. We determined accurate association constant values for the 1:1 inclusion complexes of the (Z)‐ and (E)‐HTI isomers by using isothermal titration calorimetry experiments. The results showed that the stability constants of the (E)‐HTI complexes were 2.2–2.8‐fold lower than those of the (Z)‐HTI counterparts, which explains the lack of light‐induced release of the former to the bulk solution.